The results of this down more are clear.. stock up at the bottom, we're just getting started..
Nice post and avatar, thanks. Is BTC completely in same class like all other assets? Like gold or Euro ? ... Isn't there a mining regulation? Why should I mine by spending 3000-4000$ and getting 400$ ... for losing money.... Noo I think mining will stop after 2000 and if transactions doesnt effect price will go up again. But if transactions in get worse situation as slow speed or high fee BTC may then sink... not to 400 to 0 maybe. @erdincgc91, Mining is based on difficulty that is what you're not factoring in, the more price drops the less people mine the lower the difficulty, so yea some will keep mining. This idea is far-fetched and unlikely. This would have BTC correcting to 1/50th of its all-time high. Not very realistic. @crypto_gunther, realistic? a assets going from sub pennies to 20k in less than 10 years of it's creation, now that's realistic. @99nines, if the thing is a completely new to human kind any percentage is possible. If a company invents a molecular transportation machine now that companies value will incredibly increase. And that will not be a fake valuation. 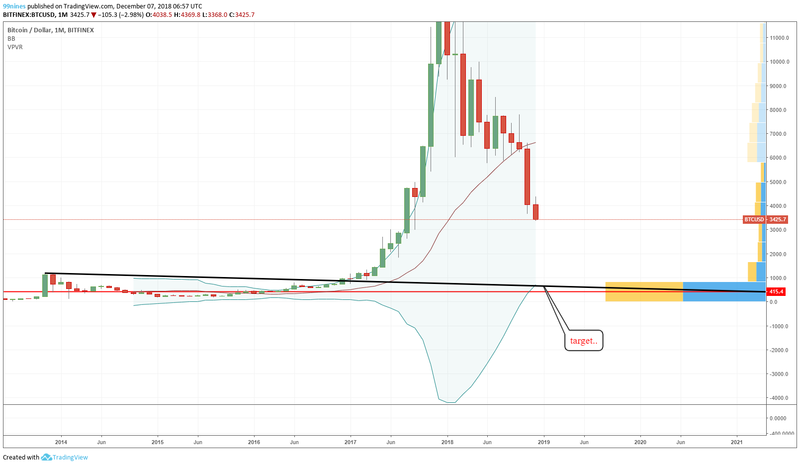 Hmm is btc that , maybe not, maybe close. it shouldn't go past the previous high of about 1500$ ..
scroll down a bit ..